The Mibrasa HMB worktop charcoal oven is available in three different sizes, meeting the needs of establishments catering for between 75 and 160 diners. 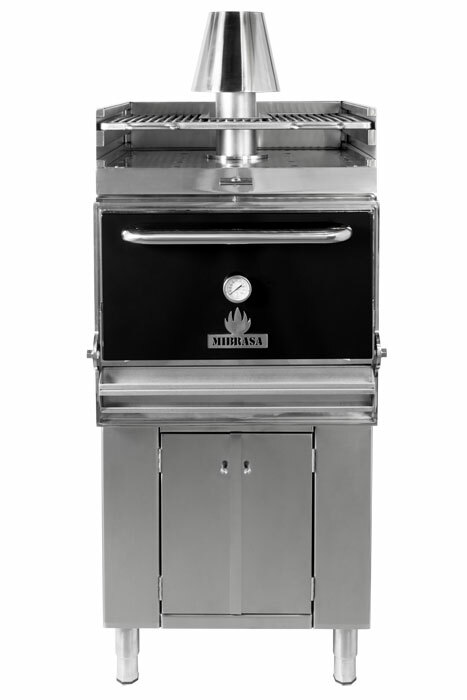 Dimensions range from 700x700x1030mm for the Mibrasa HMB 75 (75 diners) up to 920x900x1120mm for the Mibrasa HMB 110 (110 diners), with the grill sizes in turn ranging from 500x600mm to 720x800mm. Depending upon the model chosen, cooking temperature is reached in between 25 and 35 minutes, and typical charcoal consumption is from 29lbs to 45lbs per day. 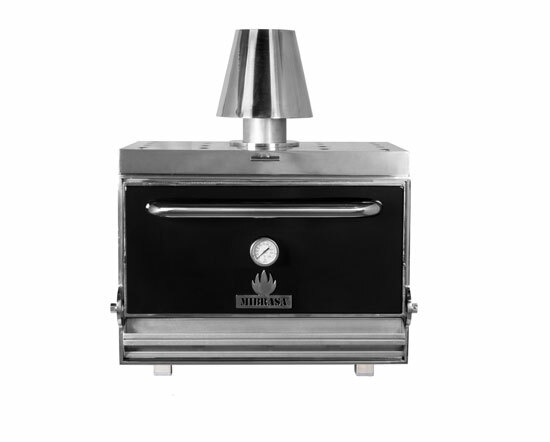 The Mibrasa HMB AB is the basic stand-alone Mibrasa charcoal oven, featuring a spacious one-shelf storage cupboard underneath the oven, perfect for cooking utensils and other items. As standard with all Mirbasa ovens except the HMB Mini, it is available in three different sizes, with a maximum capacity of 160 diners. Dimensions are similar to worktop ovens in terms of width (700 to 920mm) and slightly more slender in terms of depth (640 to 840mm). The addition of the cupboard means that overall height rises to between 1660 and 1710mm. Cooking temperature is reached in between 25 and 35 minutes depending upon size, with typical charcoal consumption ranging from 29lbs to 45lbs per day. 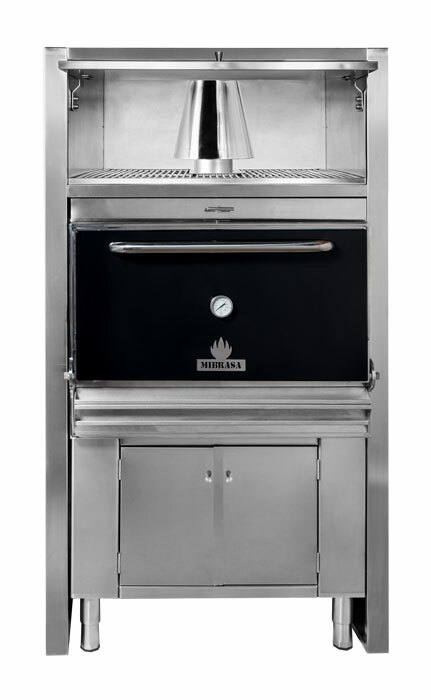 The Mibrasa HMB AB-SB charcoal oven combines all the features of both the AB and SB models, delivering a stand-alone oven complete with heating rack and spacious storage cupboard. The one-shelf stainless steel cupboard stands underneath the oven, and is perfect for storage. The heating rack is above the oven and has two separate levels to allow accurate temperature control to keep food hot in an easy and economical way. The HMB AB-SB is available in three different sizes, with a maximum capacity of 160 diners. Dimensions range from 700x640x1810mm to 920x840x1860mm, with grill sizes going from 500x600mm to 720x800mm. The oven reaches cooking temperature in between 25 and 35 minutes depending upon size, and consumes between 29lbs and 45lbs of charcoal per day. 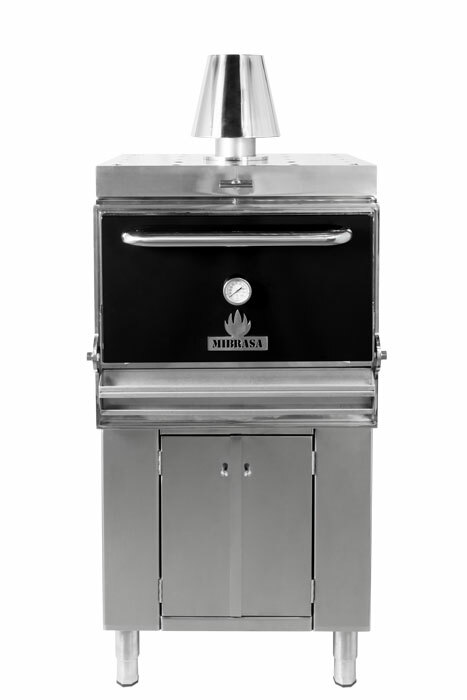 The Mibrasa HMB AC charcoal oven allows the ultimate combination of storage and controlled indoor charcoal cooking. It includes a cupboard below the oven, perfect for storing your utensils, along with a cupboard above and a grill for keeping cooked food warm in a practical and economical way. It is offered in three different sizes, with a maximum capacity of 160 diners. Dimensions range from 850x650x1870mm to 1070x850x1870mm, with grill sizes going from 500x600mm to 720x800mm. The oven reaches cooking temperature in between 25 and 35 minutes depending upon size, and consumes between 29lbs and 45lbs of charcoal per day. The Mibrasa HMB AC-C adds an extraction hood to the already powerful HMB AC model. 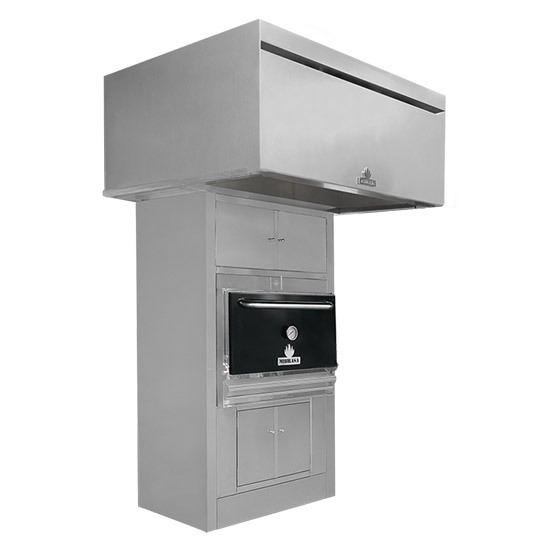 The hood is made of stainless steel, with an external ventilator manufactured and customised especially for Mibrasa ovens. In other respects, it is similar to the HMB AC, meaning it too includes a cupboard below the oven, perfect for storing your utensils, along with a cupboard above and a grill for keeping cooked food warm in a practical and economical way. It is offered in three different sizes, with a maximum capacity of 160 diners. Dimensions range from 1300x1300x2470mm to 1500x1500x2470mm, with grill sizes going from 500x600mm to 720x800mm. The oven reaches cooking temperature in between 25 and 35 minutes depending upon size, and consumes between 29lbs and 45lbs of charcoal per day. 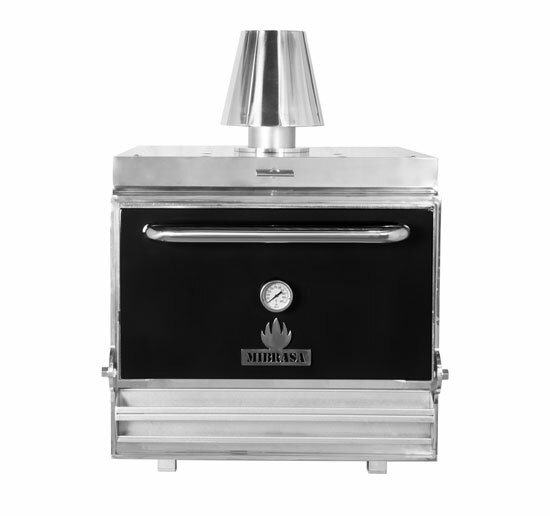 The Mibrasa HMB Mini is the entry-level Mibrasa charcoal oven, ideal for bars, small restaurants, and even homes. Its compact size (700x490x880mm) fits neatly onto a worktop, and its grill size of 500x300mm is sufficient for facilities catering for up to approximately 35 diners. It reaches cooking temperature in approximately 20 minutes and consumes approximately 16lbs of charcoal per day.